Growing vegetables from seed is a common practice for many home gardeners. Unfortunately, vegetable seed (even though it appears perfectly healthy) can sometimes be contaminated with disease-causing organisms, particularly disease-causing bacteria. Bacterial speck (see University of Wisconsin Garden Facts XHT1250, “Bacterial Speck of Tomato”), bacterial spot (see University of Wisconsin Garden Facts XHT1244, “Bacterial Spot of Tomato”), and stem canker of tomato, as well as bacterial spot of pepper and black rot of crucifers such as cabbage and broccoli (see University of Wisconsin Garden Facts XHT1225, “Black Rot of Crucifers”) are common bacterial diseases where pathogens can be introduced into a garden via contaminated seed. Making sure your vegetable seed is pathogen free is an important first step in preventing these diseases from being a problem. 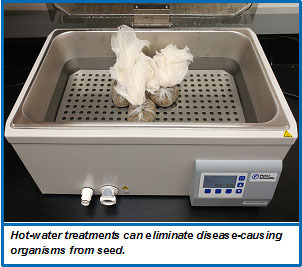 Hot-water treatments can eliminate disease-causing organisms from seed. Hot-water seed treatment is one method that you can use to eradicate, or at least reduce the level of pathogens (particularly bacterial pathogens), in vegetable seed. Some commercial vegetable seed companies routinely use this method (as well as other more stringent decontamination methods) to eradicate pathogens. Hot-water seed treatments are effective because hot water soaks into the seed for a brief time and kills disease-causing organisms, without killing the seed itself. Other common seed treatments (e.g., fungicide treatments) can also help reduce disease, but typically do not eliminate pathogens that have penetrated the seed coat. Hot-water seed treatment works best for small seed. It is not as effective for large or extremely fragile seed, pelleted seed, primed seed (i.e., seed treated to speed germination), fungicide-treated seed, and old seed. When using hot water seed treatments, treat only the amount of seed that you plan on planting. Treatment temperatures and durations will vary depending on the particular crop (see Table 1). To most effectively hot-water treat seed, use a water bath (in home cooking often referred to as a “water oven”) with precise temperature and timing control. Such equipment will provide the most consistent and uniform heating, but unfortunately can be very expensive. Alternatively, you can use a large pan heated on a stove. In order for this method to work, you will need to use a precise thermometer to accurately and frequently measure any changes in temperature. In addition, you must mix the water thoroughly, adjust the stove settings appropriately and submerge the seed completely during the treatment process to ensure that the seed receive a constant and uniform temperature at all times. Water that is too hot may injure the seed; water that is too cold will not eradicate pathogens. Apply fungicide seed treatments according to the manufacturer’s instructions (optional).